This is a hammered ingot piece. This means that the silver was melted and poured into an ingot, which was then pounded during repeated annealing. The silver was then run through a hand rolling mill to get an even thickness to the silver so that the pieces could be cut from this sheet. This is a hollow piece with a flat back and domed, convex oval surface. The shank splits into four narrower bands before attaching to the ring back. Newly made, this piece looks like it is fifty years old because it was made with the same traditional techniques used fifty and one hundred years ago. Very few modern Navajo silversmiths use the old method of hammering ingot to prepare the silver for making jewelry. 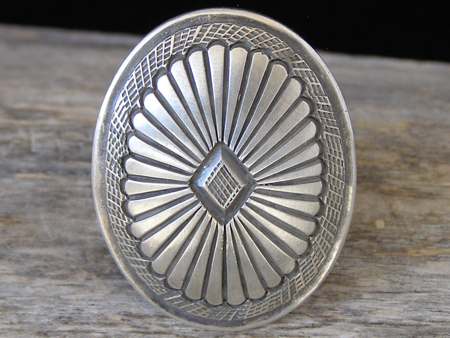 Hallmarked C.MTZ inside an arrowhead and stamped Navajo and Sterling on the ring back. Dimensions of oval face: 1 3/8" x 1 1/8"